July 3, 2017  Six classically-trained musicians, rooted in six different countries, come together to perform a new composition inspired by Woody Guthrie's "This Land Is Your Land." May 28, 2013  The folk music icon's relationship with his home state has always been complicated. To many in Oklahoma, Guthrie's progressive political views didn't fit with a strong conservative streak during the Cold War period. His reputation there is now closer to full restoration as Tulsa opens his archives. November 16, 2008  Guthrie has had a profound influence on American music, and he was such a prolific writer that some of his lyrics have yet to be set to music. Having been given access to the Guthrie archives, singer-songwriter Jonatha Brooke recently released The Works, which adapts previously unreleased Guthrie lyrics. 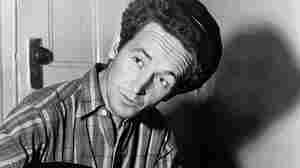 July 13, 2007  In May 1941, folk singer Woody Guthrie was hired by the federal government to travel up the Columbia River in the Pacific Northwest and write about what he saw. Among the 26 songs Guthrie penned that month are "Roll On Columbia" and "Grand Coulee Dam." December 15, 2006  One of critic Robert Christgau's favorite CD's of the year is also a holiday CD: Happy Joyous Hanukah, with music performed by America's premiere Klezmer band, The Klezmatics. 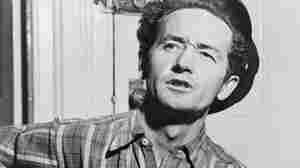 But the lyrics are all written by folk icon Woody Guthrie. Although Guthrie wasn't Jewish, his wife was; her background inspired a collection of words never before set to music. August 2, 2004  An online animated short is under criticism from the publisher that owns the copyright to Woody Guthrie's song "This Land is Your Land." The political parody features President Bush and Democratic nominee John Kerry singing very different lyrics to the tune. Guthrie's son, Arlo, calls in from a Flying J truck stop in Des Moines, Iowa, to offer his take on the controversy. June 12, 2000  Rock critic Ken Tucker reviews "Mermaid Avenue, Vol. 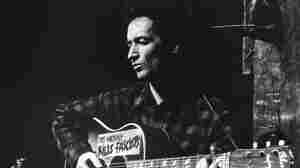 2 " by British folksinger Billy Bragg, and the American rock band Wilco. 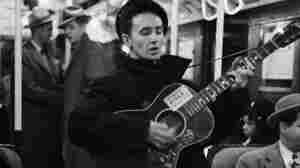 It's a sequel to "Mermaid Avenue" a collection of Woody Guthrie lyrics set to music. 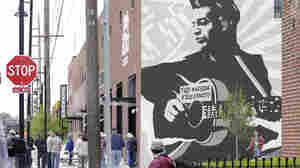 July 10, 2012  Though Guthrie died in 1967, his 100th birthday is a celebration of not only one man's legacy, but also songs that have given a voice to working folks everywhere. Hear a mix that demonstrates how Guthrie's stage presence, poetics and grasp on musical performance remain influential to this day. July 11, 2012  A massive influence on the likes of Bob Dylan and Pete Seeger, the author of "This Land Is Your Land" — and thousands of other songs — remains an inspiration to musicians nearly 45 years after his death. July 12, 2012  The legendary folksinger wrote hundreds of political songs, children's tunes and ballads, including "This Land Is Your Land," "Pastures of Plenty" and "Pretty Boy Floyd." 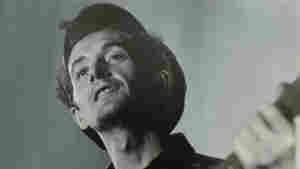 Many of his tracks appear on a new CD box set released by Smithsonian Folkways. July 5, 2012  A poet of the people, the balladeer wrote some of the United States' most important songs, including "This Land Is Your Land." He captured the heart of hard economic times and war while struggling with poverty and personal demons. He would have been 100 this year. July 3, 2012  In her interpretation of his songs we hear the way we all maneuver through more than one culture. 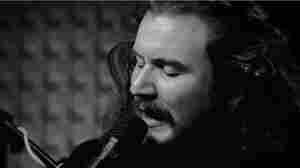 February 27, 2012  The My Morning Jacket singer, with members of Son Volt, Centro-Matic and Varnaline, puts Guthrie's lyrics to music. 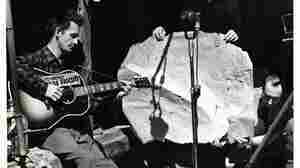 February 15, 2012  Folklorist Nick Spitzer tells the story of Woody Guthrie's leftist national anthem.